Many Americans will have hundreds, if not thousands of dollars, disappear from their Flexible Spending Accounts (FSA) at the end of the year. If your employer has provided you with an FSA, you’ve set aside a portion of your earnings all year to pay for potential medical costs. Perhaps you’ve spent some of those funds on doctor visits or prescription medicine, but it would be a shame to let the rest of this money go to waste! No need to worry, SingleCare can help you get the most out of those remaining FSA dollars before they disappear. A flexible spending account (FSA) is a popular tax-advantaged financial account that employers can offer their employees. It allows the employee to set aside a portion of earnings (pre-tax) to pay for qualified expenses, such as dental care, prescriptions, deductibles, or other out-of-pocket health expenses. Because FSA contributions are pre-tax, you’ll save as much on your medical procedures as you would have spent on taxes. It’s a win-win, right? Generally to be eligible for an FSA you have to be an employee of an employer who offers an FSA. You do not have to have any health insurance to be eligible for an FSA. Let’s compare the Health Savings Account to the Flexible Spending Account. Both HSAs and FSAs allow employees to set aside money to spend on qualified healthcare expenses and monthly prescription costs. An FSA has no eligibility requirements, but only people with a high-deductible health insurance plan (HDHP) qualify to sign up for an HSA. FSA funds do not rollover to the next year if they are unused, but funds from an HSA will carry over to the next year. Also important to note, in most cases, you will lose your FSA if you change jobs. Your HSA can carry over to your new job. 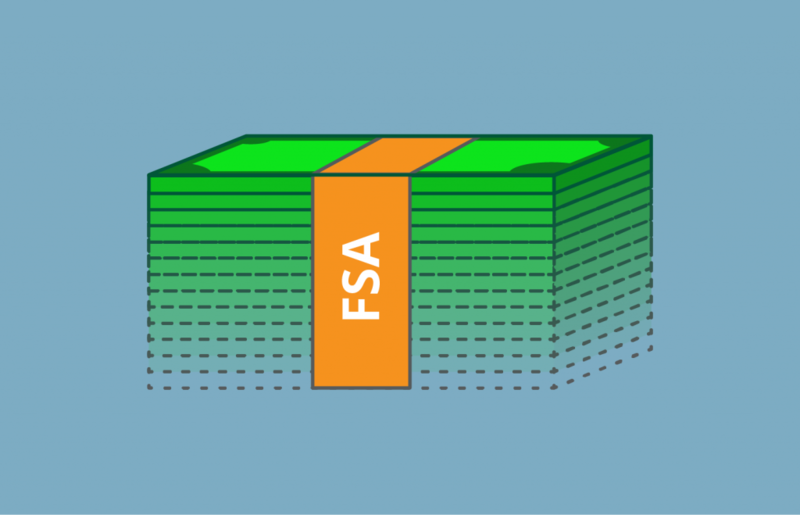 Both FSAs and HSAs have an annual contribution maximum, but the HSA maximum is generally higher. Health FSAs allow employees to set aside money for anticipated medical costs throughout the year. As a benefit to employees, the full contribution is available on day one of the plan for usage. To make the most of your FSA funds, use SingleCare to save on prescription, dental, vision, and video doctor visit costs. SingleCare allows you to compare costs you get the most affordable option in your area. Employers often remind employees to “Use it or lose it” toward the end of the plan year, to encourage usage of FSA funds before they are forfeited. Generally, FSAs expire at the end of the plan year, with some plans offering a grace period of up to 2.5 months or a maximum carryover of $500 into the following year – but employers are not required to offer these options. Review your FSA benefits to get a full understanding of when your contribution gets forfeited and where the funds go if you can’t use them in time. Some employers allocate forfeited dollars as taxable income among all plan participants. Get an extra dental cleaning: Most dental plans only cover up to two cleanings a year, but going for an extra one is a great choice. Replace a filling: Even if your filling hasn’t failed, you can get an upgrade to prevent future damage and expenses. Additionally, modern fillings are virtually invisible! Splurge on dental implants: If you happen to lose a tooth due to a legitimate medical condition and still have the maximum amount of funds available in your FSA, a single implant can be enough to deplete your entire FSA contribution just in time for year-end. Unfortunately, cosmetic dental procedures are not covered, but if a doctor provides a Letter of Medical Necessity for your dental procedure, you’re in luck. Bonus: SingleCare offers savings on many dental procedures, including implants, and FSA is a great way to keep out-of-pocket costs even lower. Simply submit your dental bill from SingleCare to your FSA provider for reimbursement. New glasses: One of the most common suggestions is to take a trip to your optometrist and splurge on a new pair of glasses. With your eye prescription, both eyeglasses and sunglasses are eligible for reimbursement. Contact lenses and contact lens solution are also covered. You can even buy a new pair of reading glasses, no prescription required. Lasik Surgery: It is possible to pay for this laser vision correction surgery with FSA funds. It must be deemed necessary by an ophthalmologist, but using FSA funds can greatly decrease the cost of this expensive procedure. Out-of-pocket Rx: If you pay out-of-pocket for prescriptions, pick up a few months’ supply before your FSA balance expires, and file the expense as a claim. Some prescriptions will only let you purchase one month at a time, but if you were planning to renew them after the deadline, make sure to do it now. Bonus: Search SingleCare for savings on prescriptions and see how much you can save! SingleCare partners with over 35,000 pharmacies nationwide so you can you can get affordable prices for your prescriptions. You can submit your pharmacy receipts to your FSA provider. OTC products: Many over-the-counter medical items, for which you can get a prescription, can also be submitted for reimbursement to FSA. * If your doctor recommends OTC items like Advil for pain relief or Claritin for allergies, just make sure you receive a prescription for reimbursement eligibility. Certain items like wheelchairs, walking aids, home medical devices, and more do not even require a prescription. Acupuncture: If you’ve been curious about this alternative medicine rooted in ancient Chinese techniques, now is the time to test it out. Acupuncture has been known to help with pain relief, muscle and joint pains, arthritis, digestive issues, and even depression. So long as the treatment is deemed medically necessary by a doctor, it is FSA eligible. Note that a benefits administrator may require a Letter of Medical Necessity to approve the treatment. Chiropractic treatment: As long as the treatment is deemed “medically necessary,” a trip to the chiropractor for an adjustment or a massage is allowed. Chiropractors focus on the diagnosis and treatment of neuromuscular disorders and manipulate the spine to ease the pain, reduce pressure, and increase overall health. It’s so easy to sign up and save with SingleCare if you haven’t already. Search and compare pricing for prescriptions and dentists in your area, show the pharmacist or receptionist your SingleCare card and see the savings. With SingleCare, expect year-round savings and clear pricing, that’s both healthy for you and your wallet. *Note: The IRS defines which medical expenses are eligible under a tax-deferred account. However, employers plans may also have their own set of eligible items. Please check with your benefits administrator to determine which expenses are eligible before you shop.